We’d love your help. Let us know what’s wrong with this preview of The Man-Eating Leopard of Rudraprayag by Jim Corbett. To ask other readers questions about The Man-Eating Leopard of Rudraprayag, please sign up. The copy of this book I have is copyrighted 1948. The events in the book took place from 1918 to 1926...eight years. Jim Corbett is well known to most "outdoors types" and wrote a good number of books. His style is mostly a straight forward one in that he tells events as they happened laying them out factually. He doesn't embellish the facts for effect or seek to make them more horrific or more "dangerous seeming". He doesn't have to. As he opens the book Mr. Corbett mention that the official rep The copy of this book I have is copyrighted 1948. The events in the book took place from 1918 to 1926...eight years. Jim Corbett is well known to most "outdoors types" and wrote a good number of books. His style is mostly a straight forward one in that he tells events as they happened laying them out factually. He doesn't embellish the facts for effect or seek to make them more horrific or more "dangerous seeming". He doesn't have to. As he opens the book Mr. Corbett mention that the official reports of this man eater say he killed 125 people, but Mr. Corbett says, "I know this is wrong." My thought? Well of course these numbers are always inflated... But no. Mr. Corbett (he can also be called Colonel Corbett as he was a colonel in British Indian Army) says that he knows of several kills that happened while he was there that aren't counted in the official tole. The number is greater, probably much greater than 125 people killed. There are many reasons why any big cat becomes a "man-killer". Corbett discusses a few here but in this case he thinks he knows what turned the leopard into a human killer, why it developed a taste for human meat. The first known appearance of the man-eater is in 1918. The normal way the dead were (and often still are) handled in India was that they were cremated on a stream bank where the ashes could go into the water and hence to the Ganges and then on to the sea. In normal times this can be a bit labor intensive. Carry the body sometimes over miles, gather the wood and carry that to the place then clean up. This begins in 1918. The flu pandemic hit the world hard and it hit this area very hard. There was no way the full funeral rites could be carried out for all the dead. The general way it was handled (according to Corbett) was that a live coal was placed in the corpse's mouth and the corpse was rolled into a stream...or just into a valley. Corbett believes that over the 2+ years of the epidemic the leopard developed a taste for human flesh from the bodies simply left unburned and in the open. When his source of "easy meat" was cut off (when the pandemic ended)he simply began to hunt humans. Whether this is what happened of not it sounds logical. Една чудесна книга, която обаче досега бях чел само в съкратен вариант, и то като дете. Най-накрая ми попадна пълния такъв и реших да допълня празнините. Не си падам по лова, но ловните разкази и романи определено са ми интересни, въпреки че не се намират често. Други ревюта на книгата можете да прочетете при Цонко и Петьо. Както можете да се досетите, всичко случило се в книгата са действителни събития, реално случили се и описани от Джим Корбет - английски ловец, природозащитник, натуралист и п Една чудесна книга, която обаче досега бях чел само в съкратен вариант, и то като дете. Най-накрая ми попадна пълния такъв и реших да допълня празнините. Не си падам по лова, но ловните разкази и романи определено са ми интересни, въпреки че не се намират често. Други ревюта на книгата можете да прочетете при Цонко и Петьо. Както можете да се досетите, всичко случило се в книгата са действителни събития, реално случили се и описани от Джим Корбет - английски ловец, природозащитник, натуралист и писател. Прочува се като ловец на хищници-човекоядци и е автор на няколко книги за природата на Индия. Корбет имал чин полковник от британската армия в Индия и многократно е бил канен от правителството на Обединените провинции да преследва и унищожава тигри и леопарди човекоядци. От 1907 до 1938 г. той убива 33 човекоядеца, за които са твърди, че са причинили смъртта на общо над 1200 души. За тези си действия, често свързани с голям риск за живота му, Корбет заслужава огромното уважение на индийците, мнозина от които го смятат за садху (свят човек) и дори има кръстен природен парк на негово име в Индия. На доста моменти в книгата си личи, че човекът е повече ловец, отколкото писател, но това е бял кахър. След като разказва играта на куп тигри-човекоядци, сега Джим Корбет има нова задача - да отиде в окръг Рудрапраяг (80 кв. км) и да убие леопарда-човекоядец, който в продължение на 8 години е убил и изял над 120 души. Местните са ужасени и въпреки че са също ловци и имат пушки смятат леопарда за зъл дух и не смеят да му се противопоставят. Звярът е стар, грамаден (само тялото му е над 2 метра), изключително умен, хитър и не на последно място - нагъл. Да издебне и да отмъкне човек, докато е излязъл през нощта извън къщата до едното място - това да. Да разбива паянтови врати и да копае под паянтови следи, за да влезе в къщата и да те изпапа - иди-дойди. Но да сте седнали двама приятели в сумрачна стая вътре в къщата, един до друг и да си подавате наргиле... Внезапно приятелят ти изтърва наргилето, ти го взимаш от пода и му правиш забележка да е по-внимателен. Обръщаш се и виждаш на прага как леопардът вече го е пречукал в рамките на 2-3 секунди и го изнася на гръб от стаята. Не просто зловещо и ужасяващо, ами и аз не знам какво. И при други случаи съм бил свидетел на признателността на хората, но нищо не може да се сравни с това, което се случи тогава в Рудрапраяг, най-напред в инспекторския пост, а сетне и при посрещането ми на пазара. — Той уби нашия единствен син, сахиб, а ние сме вече стари и нашата къща сега е пуста. — Той изяде майката на моите пет деца, а най-малкото е само на пет месеца. Няма кой да се грижи за децата и да им готви. — Синът ми се разболя посред нощ, никой не посмя да отиде до болницата за лекарства и той умря. What a gripping tale of true adventure. This book was a page turner and I was literally biting my nails on the edge of the seat while I read it. It has been written in a very simple and structured way. The natural flow of the story, the incidents of the man eater and the methods used to gun him down was excellent. Corbett has a way of narrating a tale. In this story, his task was to kill one man eater who had created a havoc in many villages of Uttrakhand. But it was no ordinary animal. With a s What a gripping tale of true adventure. In this story, his task was to kill one man eater who had created a havoc in many villages of Uttrakhand. But it was no ordinary animal. With a sharp mind and an unusual cunning, the leopard knew almost all the ways of the human world. Jim Corbett meets his match!! The ways which Corbett used to combat the leopard showed his skills and his understanding of leopards and tigers. But somehow, due to bad luck and many other factors, gunning down this particular leopard had been difficult. While reading the book, I felt immense respect for this man eating leopard. He was also no short of being a hero. Till the last chapter, I had a doubt whether Corbett will be able to kill him or not. The most outstanding part of the book was Corbett's attitude. I loved the way how he interacted with villagers and understood their loss with immense apathy. Moreover, I loved the way he thought about the man eater as an animal who because of some unfortunate reason had been turned into a man eater. He did not think of the leopard as an enemy but only as an opponent. It was a great experience reading this book and the thrill and mystery was no short of an Agatha Christie or a Sherlock case. This is my first book from Corbett and I would surely seek an opportunity to read the rest. The reason why I bought this book was Garhwal, where the story happened. My ancestors belonged to the place and my father grew up there. I was amazed by the simplicity of the people. The natives had more than one opportunity to track or kill the leopard but they let him go because of their belief or superstition (howsoever you put it). Even Corbett mentioned that he knew men from this place to be bravest This is my first book from Corbett and I would surely seek an opportunity to read the rest. The reason why I bought this book was Garhwal, where the story happened. My ancestors belonged to the place and my father grew up there. I was amazed by the simplicity of the people. The natives had more than one opportunity to track or kill the leopard but they let him go because of their belief or superstition (howsoever you put it). Even Corbett mentioned that he knew men from this place to be bravest among all and yet the most courageous act came from a lady. But there were also others who were ready to put down their life in order to catch the leopard. I was more than impressed by the intellect of the leopard, for eight years he outsmarted his hunters but he also killed more than hundred people and haunted the rest. Absolutely fascinating. Not only does corbett describe in absolute detail, the many nights he spent hunting the evasive leopard, but he also gives you a vivid description of life in the Tehri/Kumaon region in early nineteenth century. The book also taught me a great deal about wild life, why leopards or tigers become man eaters, how to track wild animals… Jim corbett makes you fall in love with nature. The book was an amazing read! Primarily describing Corbett's personal experiences when he had been summoned to kill a leopard terrorizing the village folk of the Gharwals, India, it proved to be quite intriguing and informative! A must read for those who love to feel a rush of their adrenaline! Amazing book. a must read for all Jim Corbett fans. I have now read it twice but every time you read , you can experience the terror that was this man-eater of rudraprayag. One will be spell bound and hooked to the book right from page 1 when Jim Corbett describes the prevailing feeling in Rudraprayag when this man eater was alive. Loved it. It was a short and sweet read. Engrossing till the end. My brother had borrowed this book from the local British Library, and I started reading it casually, without any real interest in reading it fully. As I write this now after just having put the book down, I can assert that this is one heck of a story, narrated in a manner that is hugely engaging -- This is simply among the best books to be found anywhere. The book was first published in 1947, and you'd expect it to be a little "dated" in its content and style, but nothing could be farther from the truth. 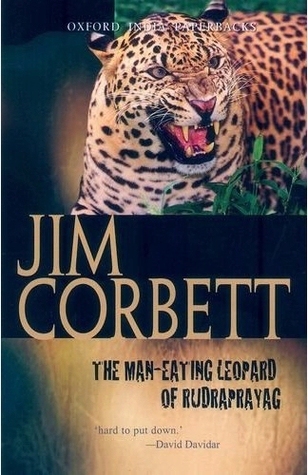 I have acquired a newfound respect for Jim Corbett the author, and believe that his legendary stature as the fearless slayer of man-eating tigers (and leopards) almost unfairly overshadows his other qualities evidenced in this book. In an era when being a trigger-happy jungle "sportsman" was probably fashionable, Corbett comes out as a brave but reluctant hunter with deep respect for the wild, whose primary motive is clearly to prevent further loss of innocent human lives. After reading "The Jungle lore" and "the man eaters of kumaon" here's another read " The man eating Leopard of Rudraprayag " by Jim Corbett that I completed reading today. The Leopard that struck a terror so After reading "The Jungle lore" and "the man eaters of kumaon" here's another read " The man eating Leopard of Rudraprayag " by Jim Corbett that I completed reading today. The Leopard that struck a terror so terrible that not a single person would be seen out of his house after sunset in whole of Rudraprayag for more than 8 years. The Leopard so smart and cunning that always outsmarted the hunters and how swiftly he killed and dragged a man or a woman or a child from a house would only be found after the half eaten body would be found deep somewhere in the jungle. A fantastic description by Jim Corbett on his hide-and-seek game with the leopard of Rudraprayag who had turned to man-eating because of a calamity. The years of the existence of the leopard, and a vast area in which it operated including two sides of a mighty river connected by just two bridges, made it a very clever operator. The failed attempts to kill the animal made it more aware of the human strengths and weaknesses, adding to its cunningness. Moreover the chosen area is the main access ro A fantastic description by Jim Corbett on his hide-and-seek game with the leopard of Rudraprayag who had turned to man-eating because of a calamity. The years of the existence of the leopard, and a vast area in which it operated including two sides of a mighty river connected by just two bridges, made it a very clever operator. The failed attempts to kill the animal made it more aware of the human strengths and weaknesses, adding to its cunningness. Moreover the chosen area is the main access route for scores of pilgrims in a community where pilgrimage is considered a part of one's life, and it gives salvation which is worth risking their life. All these, combined with the natural stealth and prowess of a leopard made it strike terror in a large geographical area, which made it take a toll on a huge number of human lives which no other cat had ever managed, and impose an undeclared night time curfew for over years together. Rudraprayag seems so surreal at times that it is enchanting! He was Corbett's fascination and love, just the way this book is, of the avid readers! Love the book and Rudraprayag's adventures...an exciting and beautifully engaging book that makes you look within and outside and appreciate the beauty of nature! This is the 1st book i have read of Jim Corbett and he was a great writer indeed. The detail and depictions made are as accurate as it can be. A book you will have difficulty putting down :) You will love this book as an Indian telling the story of maneater of not so distant past. This review has been hidden because it contains spoilers. To view it, click here. A gripping account of the man-eating leopard in the hills of Rudraprayag, who carried on with his hunt for 8 long years! Man, armed with guns, knives, poison, gin-traps and what not, was no match to his cleverness. Much revered Jim Corbett tells his tale in simple language but rich in details. He is successful in conveying the terror of the brief encounter with the leopard, the chill of the night rain in the forest and the desperation of the near miss of the leopard. The video game generation li A gripping account of the man-eating leopard in the hills of Rudraprayag, who carried on with his hunt for 8 long years! Man, armed with guns, knives, poison, gin-traps and what not, was no match to his cleverness. The video game generation like me would always think what is there in shooting a leopard, I've shot down bomber-jets. But being in the open, out of our comfort zone, humans are the most vulnerable beings. The leopard tasted human flesh from unburnt corpses, and since then started visiting the villages and pilgrim routes for kills. In certain nights, he will kill a lady sleeping in the middle of a group of sages, and still nobody would have heard a sound. His first bite on the neck will dislocate the neck joint and kill the prey. Many escaped with torn throats and ripped-off limbs. My all time favorite book! Have read is several times over since childhood and it does not cease to intrigue and amaze me. Re-read it recently - magical as ever. Jim Corbett's writing style is simple yet effective. The mental strength of the man that tracked and finally got the Man-eating leopard of Rudraprayag, which over its 8 years of terror-reign had "officially" killed 150+ human beings, is something that I marvel at. An interesting book. There were a couple of detours (e.g., the chapter on fishing and the chapter about a boar hunt) that were annoying because they had nothing to do with the main story, but the book was overall a good read. My only suggestion to Oxford University Press would be to get a better editor and FIX the multiple typos and spelling errors, which were a bit of a distraction. It is a one breath story, an exciting read from start to finish. Every page turning to reveal that it is not just yet the time for D-Day. A thrilling read...the one that will long remain in one's mind ...for the words testify the struggle the hunter had to bear to make the only kill and the survival the man-eater had to make with every human kill. enjoyed reading it up in ranikhet. went well with the daily gossip about leopard sightings and villagers' anecdotes of leopards snatching up their goats and dogs. by the end of it, i was looking over my shoulders and imagining a pair of leopard eyes watching me somewhere behind the tall trees and dense vegetation. If one loves wildlife, they cannot miss the books of Jim Corbett. I most certainly want to see a leopord, the most shy animal, once in my life, after reading this book. It's a small book and a fantastic read. Not just a spellbinding tale of disappointments, depression, failures and then triumphant end of man eating leopard hunt; Also a true to the core description of people, culture and natural beauty of Indian province long before the touch of modern era. The best book of jim corbett. The unique writing style and the sheer thril of the events unfolding dotted with the accurate observations of a skilled hunter. A must read! An excellent adventure book! I was feeling more excited because the whole story was based on true incidents. Edward James "Jim" Corbett was a British hunter, turned conservationist, author and naturalist, famous for hunting a large number of man-eaters in India. Corbett held the rank of colonel in the British Indian Army and was frequently called upon by the government of the United Provinces, now the Indian states of Uttar Pradesh and Uttarakhand, to kill man-eating tigers and leopards that were harassin Edward James "Jim" Corbett was a British hunter, turned conservationist, author and naturalist, famous for hunting a large number of man-eaters in India. Corbett held the rank of colonel in the British Indian Army and was frequently called upon by the government of the United Provinces, now the Indian states of Uttar Pradesh and Uttarakhand, to kill man-eating tigers and leopards that were harassing people in the nearby villages of the Garhwal and Kumaon region. His hunting successes earned him a long-held respect and fame amongst the people residing in the villages of Kumaon. Some even claim that he was considered to be a sadhu (saint) by the locals. Corbett was an avid photographer and after his retirement, authored the Man-Eaters of Kumaon, Jungle Lore, and other books recounting his hunts and experiences, which enjoyed much critical acclaim and commercial success. Later on in life, Corbett spoke out for the need to protect India's wildlife from extermination and played a key role in creating a national reserve for the endangered Bengal tiger by using his influence to persuade the provincial government to establish it. The national park was renamed Jim Corbett National Park in his honour in 1957 after his death in 1955.